Korean plus Fried plus Chicken sets my expectations for greatness. Especially lately when my hot sauce of the moment is gochujang. I can clearly see an evolution in my palette having first embraced sriracha, then sambal and now this richer, spicier version that is deepened with a funky fermented bean paste. I came home with chicken wings the other day despite my historical eye rolling when my dad did the same, yelling “Maru! I picked up dinner!” The difference here is that these would be an appetizer and at least one, and likely several, vegetables would also grace the plate. I wanted something super crisp that would be glazed with a punch of flavor and enough heat to make you keep eating, but not so much your lips felt like Blinky the Clown*. So I settled on a mixture of rice flour and pulverized rice crispies. The sauce would be gochujang blended with something sweet, sesame and maybe even citrus. And there would be fresh green in form of cilantro and green onion. I think I succeeded. The first batch came out a tad dark even though they still tasted great. But the cooler oil in the second batch allowed for nice browning and the coating had a serious crunch. Even several hours later when I snuck a couple more, cold, from the fridge. Since I was busy eating the first batch while I fried the second batch, all I have a photo of is the darker one. But I think you get the idea. Mix all chicken ingredients (through oil) together and marinate up to an hour. Pulse 1 cup rice cereal in a spice grinder or crush in a plastic bag until you have a mix of fine powder and some larger pieces. Mix with corn starch. Drain chicken reserving marinade. Mix all glaze ingredients and set aside. Pour oil into a tall pot so you have enough to fry several wings, but without going beyond the halfway mark of the pot. Heat to just shy of 350º. Toss wings with starch and cereal mixture adding back a little bit of marinade to help mixture stick. Fry several at a time 6-8 minutes. Drain on paper towels. Brown remaining 1/4 cup rice cereal in a teaspoon of oil. 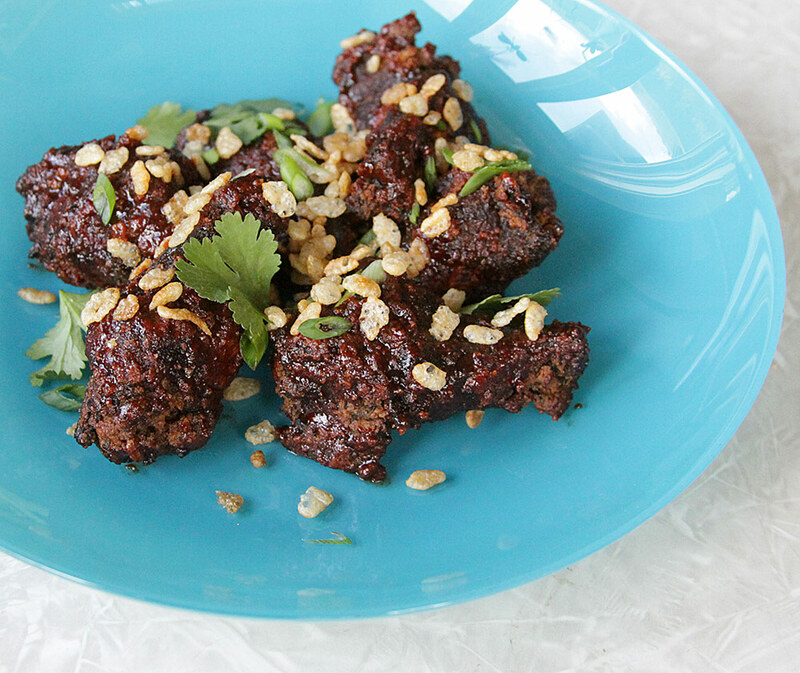 Toss wings with glaze, garnish with cilantro, green onions and rice cereal and eat right away. * I realize that Blinky was a Denver institution and some of you may have no idea what I am talking about…so just picture any clown with giant lips and you’ll get the picture. This entry was posted in Chicken, Korean by Marina Chotzinoff. Bookmark the permalink.